October 13, 2018 By Todd Burgreen & filed under All Articles, Rifles & Carbines, Weapons. A plethora of AR-10 style rifles are vying for consumer attention, albeit individuals, departments, or other entities. Christensen Arms CA-10 G2 is worth considering based on attention to detail and quality of materials used in its manufacture. Any mention of Christensen Arms brings forth an association with their precision bolt-action hunting rifles featuring carbon-fiber-wrapped barrels. This is understandable, as these were the initial product offerings. Various models of Christensen weapons have been brought forward since Dr. Roland Christensen (Doctorate in Mechanical Engineering) saw a way to apply his day-job experience to his hobby. Hunters benefited from carbon-wrapped barrels in terms of less weight and better heat dissipation. Not resting on previous success, the company now builds a full range of firearms. This brings us to our article topic—the Christensen Arms CA-10 G2 chambered in 6.5 Creedmoor. Titanium flash hider fits almost seamlessly at end of Christensen’s carbon-wrapped barrel, giving Christensen rifle very distinctive aesthetics. Only top-tier components are incorporated into Christensen Arms ARs, which arrive with a sub-1 MOA accuracy guarantee. One overarching theme with the Christensen Arms ARs, stemming from their carbon-wrapped barrels, is keeping weight down so as to maximize user efficiency without sacrificing performance. The CA-10 G2 I tested weighed 7.2 pounds. 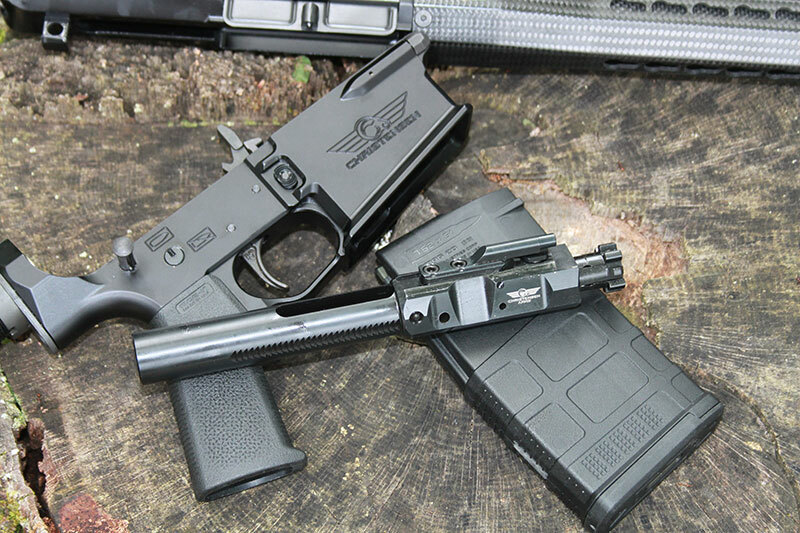 This is outstanding considering a rail is present, as well as other features that are typically avoided in other builders’ efforts when attempting a lightweight AR-10. After years of experience and dozens of training courses, I have formed strong opinions about what constitutes an effective rifle: a return to AR basics such as great-handling rifles with potent firepower. This applies to both AR-15 and AR-10 series rifles. This is especially true for private citizens (hunters or defensive shooters) and even most law enforcement personnel, who do not require the plethora of accessories currently found on ARs. Christensen Arms offers such a platform with its CA-10 G2, with the added benefit of it being chambered in 6.5 Creedmoor (.308 Winchester is also available). The accuracy potential of a quality AR-10 type weapon is often on par with or exceeds some bolt-action rifles. Over the last few years, the AR-10 has evolved into no longer being limited by the capability of the .308 Win cartridge—its most popular chambering. This is thanks to cartridge development that will now fit into the .308 Win footprint while offering vast improvement in ballistic performance. Premium 6.5 Creedmoor ammunition from Hornady and Federal combined with Christensen CA-10 G2 provided outstanding accuracy. 100-yard groups were harbingers of great long-range accuracy results. The 6.5 Creedmoor was created by Hornady in 2007 for long-range target-shooting applications. Hornady designers utilized the compact, efficient cartridge concept by using the .30TC case as its basis. The .30TC itself evolved from the .308 Win. The 6.5 Creedmoor typifies the short and efficient cartridge principle. 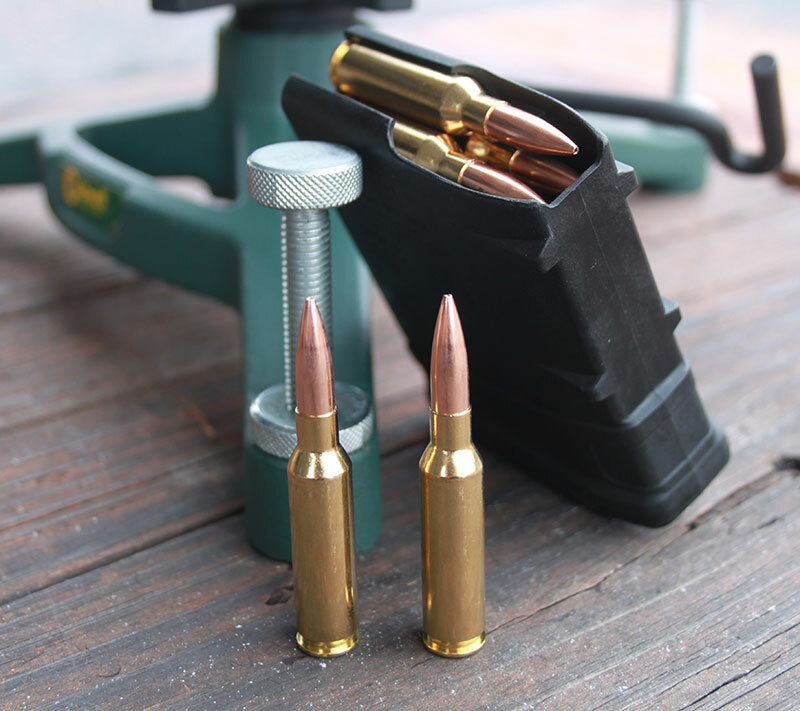 The 6.5mm Creedmoor cartridge’s reputation for high ballistic coefficient (BC) rating as well as sectional density (SD) while firing 120- to 140-grain bullets has attracted hunters, tactical, and target shooters to it as well. It’s hard to beat 130 grains moving at nearly 3,000 feet-per-second. SD is the ratio of a bullet’s mass to its cross-section. All things being equal, a high SD penetrates better than a low SD. BC is a measurement of how well a bullet moves through the air. Velocity loss and impact of wind drift are minimized the higher the BC rating as the round travels downrange. The final sweetener is the 6.5 Creedmoor’s moderate recoil. 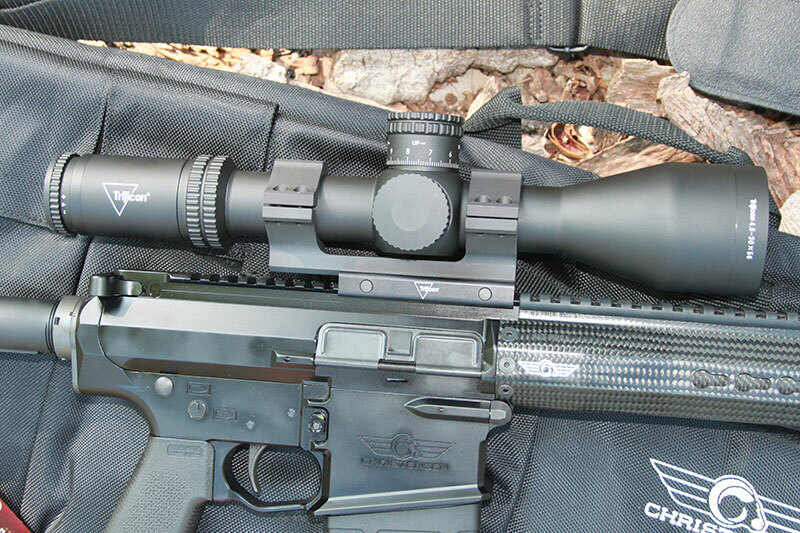 Trijicon Accupower optic with its wide 4.5-30X magnification range was an ideal choice for Christensen CA-10 G2 6.5 Creedmoor. Quality optic is an equal part of the accuracy triumvirate, along with rifle and ammunition. Trijicon Accupower was up to the challenge in wringing out full potential of 6.5 Creedmoor premium loads and Christensen CA-10 G2 rifle. An important part of the accuracy equation is a quality optic to go with the cartridge and rifle. A Trijicon Accupower 4.5-30x56mm optic was mated to the CA-10’s upper receiver rail. The Accupower features five intensity settings for the red or green illuminated reticle choices. The Accupower is evolving into Trijicon’s flagship variable-power optic featuring a 34mm tube. The 4.5-30X zoom is impressive, with the 56mm objective lens aiding in acquiring and identifying targets at extreme distances. The Trijicon Accupower can be fitted to the biggest magnum boomers due to its 3.2- to 3.8-inch eye relief, depending on power setting. The Trijicon’s tough construction is perfect for recoil resistance due to inertia forces experienced during recoil. Exposed 100 MOA elevation adjustment range with Return to Zero and 50 MOA capped windage adjustment range with optional Windage Restrictor lend well to long-range shooting adjustments. The Trijicon Accupower 4.5-30x56mm features ED (Extra Low Dispersion) glass, which is further enhanced with a multi-coated broadband anti-reflective finish that virtually eliminates glare and loss of light. ED glass prevents or lessens chromatic aberration because it concentrates and directs the wavelengths of light more effectively. Generally speaking, the better the aberrations are controlled, the cleaner and brighter the image will appear. This is especially important for long-range high-magnification observation. ED glass is usually reserved for premium optics due to the cost associated with it. The Trijicon Accupower 4.5-30x56mm is a good fit for the semiautomatic, yet long-range capable, 6.5 Creedmoor Christensen CA-10 G2. Black Nitride coated bolt is used with CA-10 G2, along with 7075 aluminum billet upper and lower receivers. The CA-10 G2’s components are of proven quality and performance, with cost not serving as the driving force of selection. A Christensen Arms Match carbon-wrapped 20-inch barrel featuring a 1:8 twist is capped with a titanium flash suppressor. A black Nitride coated bolt is used. The handguard’s carbon-fiber material minimizes weight and prevents the CA-10 from being front heavy, especially when combined with the carbon-wrapped barrel. This positively impacts handling while allowing for effective cooling of the barrel. 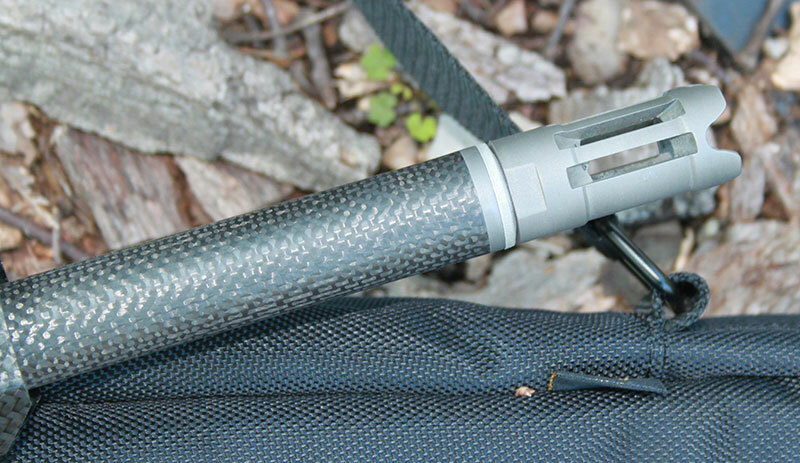 The carbon-fiber handguard is textured for a positive grip anywhere along its length. A Picatinny rail runs under the forend handguard for mounting of accessories. A Match trigger group rides in the Christensen Arms CA-10’s lower receiver. An over-engineered match or any kind of competition trigger that can malfunction or go out of adjustment is not suitable. A BCM adjustable rear stock is used. All of the CA-10 G2’s features are intended for maximizing effectiveness no matter the role envisioned by the end user. 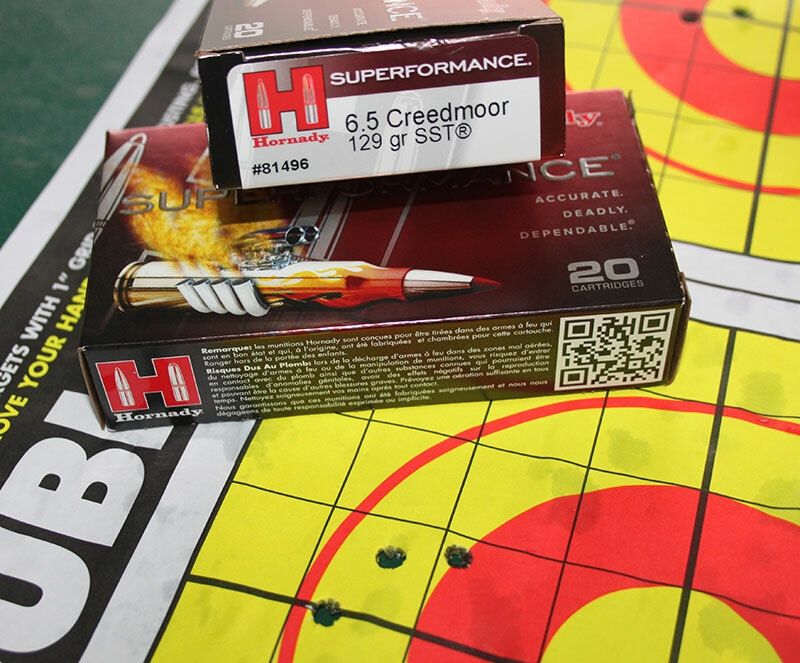 Initial sighting in and accuracy sampling of various Hornady and Federal 6.5 Creedmoor loads was conducted from bench. The Christensen CA-10 G2 was initially sighted in at Echo Valley Training Center (EVTC) with a 100-yard zero. Different 6.5 Creedmoor loads were fired from the bench to determine a base accuracy level. Various loads from Hornady and Federal consisted of a mix of hunting and match loads to illustrate the ballistic flexibility inherent in the 6.5 Creedmoor. These specific loads were Federal 120-grain Trophy Copper, Gold Medal Berger 130-grain Hybrid Match, and 140-grain Nosler Accubond. Hornady offerings were represented by 129-grain SST, 140-grain ELD Match, and 120-grain GMX. 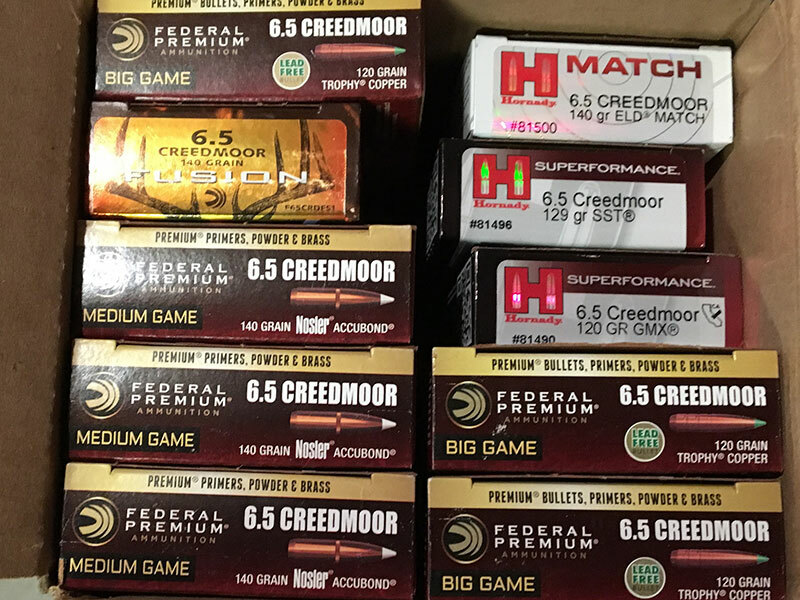 This is just a small sampling of the 6.5 Creedmoor loads available from each company, with other companies offering even more. Overall accuracy was impressive, with no load producing groups over 1.25 MOA at 100 yards and with some bordering on 5/8 inch. EVTC is properly set up to handle extensive test firing of a precision tactical rifle like the Christensen CA-10 G2. Witnessing accuracy from the bench caused a break in typical protocol. The 300-yard stepped berm range was skipped and we moved directly to the EVTC 600-yard Known Distance Range. As expected, recoil was minimal with the CA-10 G2. Spotting our own trace and bullet strike on steel was possible. It proved much too easy to rapidly place multiple rounds on man-sized steel 500 yards away. At times it seemed a round was still in the air as the previous shot made the steel target ring out with impact. Echo Valley Training Center’s Jungle Walk Range provided optimum T&E scenarios for CA-10 G2. It was more than manageable in terms of handling when carrying and engaging targets from standing or kneeling. Also of note was how easy the Trijicon’s reticle made hitting targets at distance. The benefit of holding directly on target after dialing in the correct adjustment is obvious. But the ability to place an appropriate hash mark on target is invaluable if in a hurry or in a target-rich environment with opportunities presenting themselves at various distances. A favorite reactive target has always been the dastardly 4½-inch diameter clay pigeon. A 100-yard zero easily translated into holding the correct hash mark below the main horizontal wire directly on target, causing hits at 300 and 500 yards. The svelte AR-10 pattern Christensen CA-10 G2 was more than manageable in terms of handling when carrying and engaging targets from standing or kneeling positions. 6.5 Creedmoor typifies short and efficient cartridge principle. Many contend that the 6.5 Creedmoor chambered in an accurate semiautomatic like the Christensen CA-10 G2 is clearly superior to the .308 Win for long-range performance because of better ballistics, less recoil, and downrange power delivered. In the same vein, the semiautomatic seven-pound Christensen offers advantages most other AR-10 rifles cannot compete with. The CA-10 G2 sacrifices nothing in terms of accuracy. Yes, first-round hits are paramount, but do not underestimate the importance of fast follow-up shots after observing initial impact or if more targets are available. A trained marksman will definitely be able to put to good use the ballistic advantages offered by the 6.5 Creedmoor CA-10 G2 with precision semiautomatic firepower. The added weight of the AR-10 platform compared to the smaller AR-15 negates inherent AR qualities of handling in many users’ minds. The CA-10 G2 addresses this, as it is lighter than some competitors’ AR-15s, let alone other AR-10 .308 Win rifles. The CA-10 G2 could be the answer to fulfilling a multitude of roles—precision rifle, general-purpose patrol rifle, or even an entry weapon. 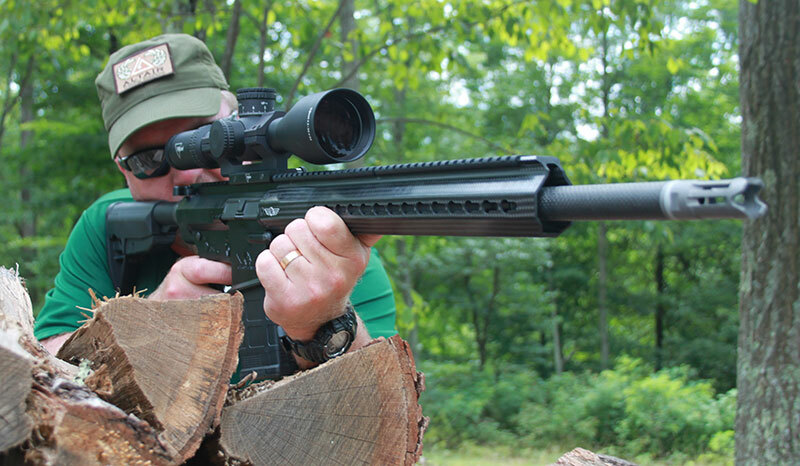 This is a positive reflection on the rifle’s accuracy, reliability, handling, and ergonomics. For a rifle to be considered versatile, it must be able to satisfy multiple roles with equal aplomb. The Christensen CA-10 G2 with its 6.5 Creedmoor chambering is such a rifle. 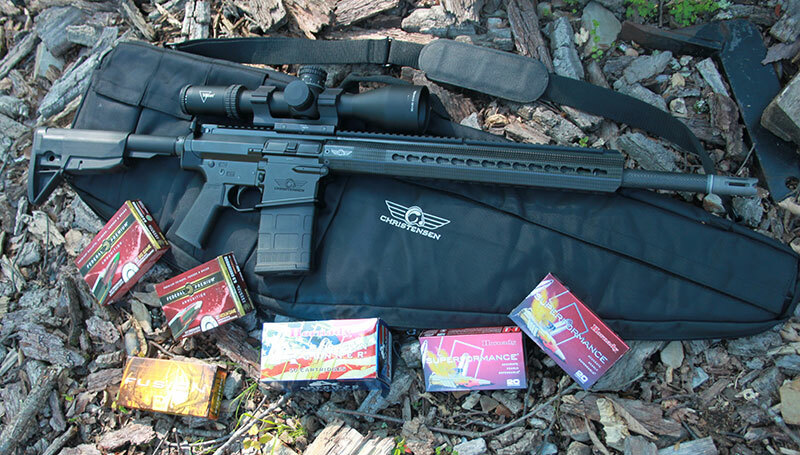 6.5 Creedmoor is well supported by various manufacturers. Hornady and Federal produce numerous offerings. These represent only a portion of 6.5 Creedmoor loads in their inventories. My guiding thought for the CA-10 G2 evaluation was to treat it similarly to an AR-15, setting up scenarios that put it to the test in terms of handling and ability to send multiple rounds downrange quickly and effectively. Working in and around vehicles provides this type of realistic feedback. While the CA-10 G2 was more than capable of connecting with steel targets arrayed along EVTC’s stepped berm out to 300 yards, working with it along EVTC’s Jungle Walk range was the true measure of whether the CA-10 G2 delivered on its promise of a different sort of AR-10. The Christensen CA-10 G2 proved reliable throughout this evaluation, with approximately 350 rounds fired, some of them rapidly, without cleaning it, and over multiple range visits. The CA-10 G2 is superior to most other AR-10 rifles I have tested in terms of handling and accuracy. The selection of a rifle is as personal as it gets. Individual preferences and prejudices will determine interest level in the Christensen Arms CA-10 G2 6.5 Creedmoor. The CA-10 G2’s near $3,000 price tag is sure to give some pause. The Christensen is worthy of consideration based on the attention to detail and quality of materials used in its manufacture. The old adage of “buy right the first time” comes to mind.